Yes, I've been AWOL for a while. I just needed a bit of a bloggy break, I guess. I'm hoping to start posting more here, but I've also been "refining" what I want this blog to be about--but that is for a different post! Both my kids are signed up for the summer reading program at the library. I love libraries--I even waxed poetically (ha!) about my love for them at the Hillsboro Argus this week. In the past, I've gone to the library on my own and picked out books for my kids. However, I've now started taking the kiddos and letting my daughter pick out 7 books at a time. Her method is pretty much to grab 7 books randomly, so it's always interesting to see what we end up with. I was a little wary of this book when my daughter found it--it seemed at first glance a bit too old for her (she's 3 years old). 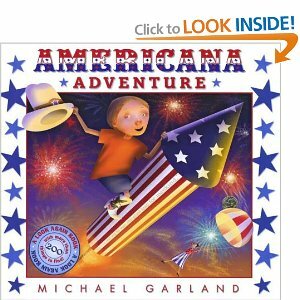 It's about a boy's "treasure hunt" through the United States, featuring almost Where's Waldo-like illustrations packed with Presidents and famous Americans. Surprisingly, my daughter loves it! It is probably her favorite book of the bunch. And it is a "Fouth of July" book--how many of those are out there? I actually ended up purchasing a copy of this book that I'll bring out closer to Independence day. 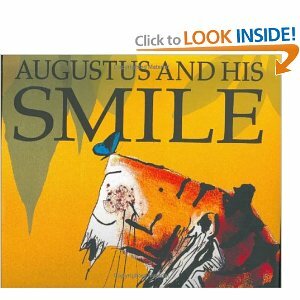 This was a quick read about a tiger searching for his smile. Both of my kids enjoyed it--especially my son. Many of the books we brought home were just a bit above him (he's 20 months), but this one was just short enough to hold his attention. My daughter seemed to really like this one (my son wasn't interested). It's a story about sibling rivalry, but done rather sweetly. 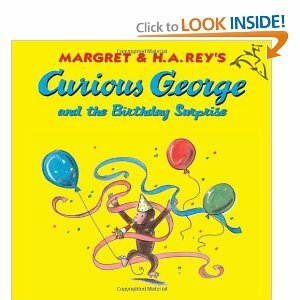 My kids love Curious George, so this one was a big hit. I'm glad my daughter only found Curious George book, or else that is all we would have had to check them all out! 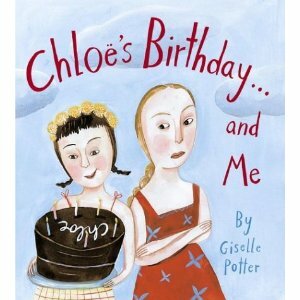 My daughter seemed to like this book--but I loved it! 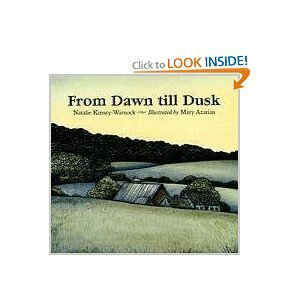 It's about the cycle of a year growing up on a farm in New England. It was too long to hold my son's attention, but my daughter asked to read it a couple of times. Neither my kids nor I are especially big fans of alphabet books, they just seem rather dull. This one, however, is quite good. 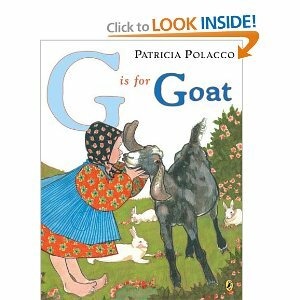 It's about goats and it tells a story about taking care of the goats while going through the alphabet. 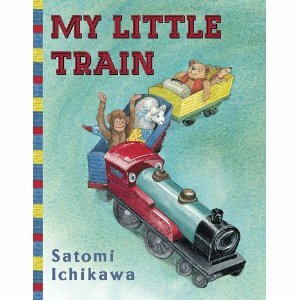 This one is about toys taking a train ride through the living room. I have to admit that none of us were that fond of this. It just seemed a bit disjointed. Well, that's what was in our library bag! We'll be getting a new batch this afternoon!